Advance Tabco PRRS-24-18 Prestige Series Stainless Steel Underbar Blender Station with Sink - 18" x 30"
Enhance staff efficiency and productivity when preparing specialty drinks with the innovative Advance Tabco PRRS-24-18 Prestige series stainless steel blender station and sink. Items found within the Prestige series of underbar equipment line up perfectly with each other, creating a uniform look across any bar. In addition to a number of eye-catching features, this blender station boasts an exclusive twist-action leg assembly for added strength and an extended backsplash to create a truly one-of-a-kind unit. 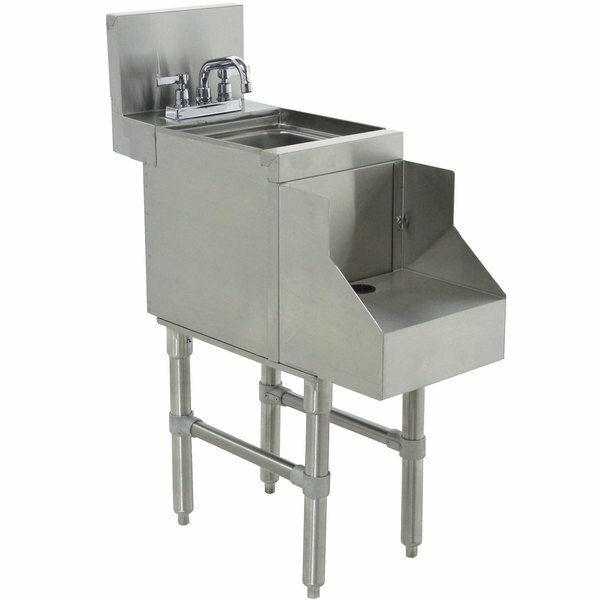 This unit combines a recessed blender shelf with a 10" x 14" x 10" deep drawn sink bowl for unparalleled convenience. The stainless steel step features a grommet hole for blender power cords in addition to a hidden 15A/120V duplex outlet beneath the shelf. A 7" backsplash protects nearby walls and floors from liquid spills, while the entire surface is sound deadened so you can provide your customers with efficient, non-disruptive service.
. A 1/2" IPS drain with a 3 1/2" basket drain are included along with a deck mount gooseneck faucet that meets federal lead free standards.